Temple’s Quinton Rose points to a teammate after a Temple basket in the second half of Temple’s win over ECU on Feb. 7. 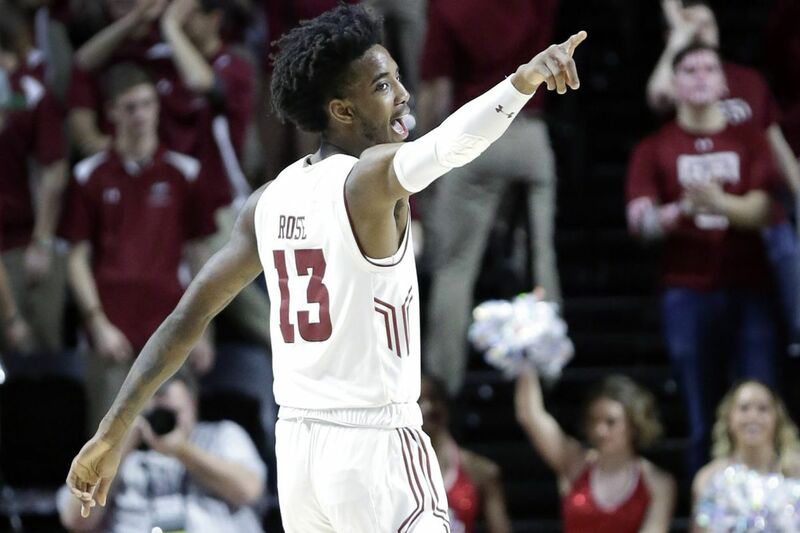 TAMPA, Fla. — Unlike some previous triumphs during its now-five-game winning streak, Temple's 73-55 victory against South Florida on Saturday didn't so much polish the Owls' NCAA tournament resumé as preserve it. Tied at 30 with the American Athletic Conference's bottom-feeder at halftime, the Owls (15-10, 7-6) forced 13 second-half turnovers to pull away before an announced Sun Dome crowd of 2,576. Temple outscored the Bulls 27-11 over the final 11 minutes, 35 seconds. The Owls held USF (8-18, 1-12) without a field goal for more than seven minutes during that stretch. "This was huge," said Owls guard Shizz Alston Jr., who finished with a sparkling stat line (19 points, five assists, one turnover) in 36 minutes. "If we lost this game, our [NCAA] chances were very slim. … We knew they were going to come out and play free, but we had a lot more to play for than they did." Flustered at the outset against USF's tight perimeter defense, the Owls needed Josh Brown's driving layup at the first-half horn to avoid a deficit at intermission. "I think they are very much a veteran team," Owls coach Fran Dunphy said of USF, which started three graduate transfers. "Not veteran in terms of all being together at USF, but they've got a lot of poise about them, and we weren't very good. We didn't do enough good things in the first half to warrant us having any kind of lead, and we got what we deserved at halftime." Sophomore Quinton Rose capped a 7-0 surge to open the second half when he stripped the ball from freshman David Collins near the top of the key on an inbounds pass and raced for a dunk at the other end. He then scored the first eight points in the game-ending 27-11 run. He was fouled on a put-back, and hit the ensuing free throw, to give Temple a 54-47 lead. A Brown three-pointer 39 seconds later gave the Owls their first double-digit advantage. Rose scored 16 of his game-high 20 points in the second half. Alston, who seemed to come up with a critical basket every time USF threatened early on, finished 8 of 12 from the floor and 3 of 5 from long range. "No disrespect to this team, but we were not going to let this team stop our NCAA tournament hopes, and that's what I told the guys," Alston said. "We're playing for something big and we needed to win this one."